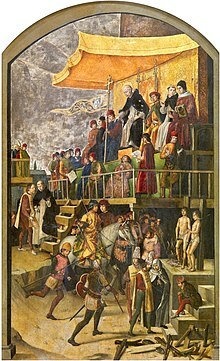 Before 1100, the Catholic Church suppressed what they believed to be heresy, usually through a system of ecclesiastical proscription or imprisonment, but without using torture, and seldom resorting to executions. Such punishments were opposed by a number of clergymen and theologians, although some countries punished heresy with the death penalty. The penances and sentences for those who confessed or were found guilty were pronounced together in a public ceremony at the end of all the processes. This was the sermo generalis or auto-da-fé.Penances (not matters for the civil authorities) might consist of a pilgrimage, a public scourging, a fine, or the wearing of a cross. The wearing of two tongues of red or other brightly colored cloth, sewn onto an outer garment in an "X" pattern, marked those who were under investigation. 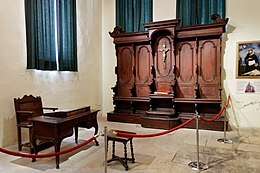 The penalties in serious cases were confiscation of property by the Inquisition or imprisonment. This led to the possibility of false charges to enable confiscation being made against those over a certain income, particularly rich marranos. 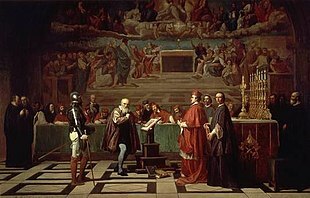 Following the French invasion of 1798, the new authorities sent 3,000 chests containing over 100,000 Inquisition documents to France from Rome.